A sea squid (L) and white coral (R) are seen in the Mediterranean Sea. The world's coral reefs could be wiped out by 2050 unless urgent action is taken to stop threats posed to the "rainforests of the sea" by everything from overfishing to climate change, a report warned. The world's coral reefs could be wiped out by 2050 unless urgent action is taken to stop threats posed to the "rainforests of the sea" by everything from overfishing to climate change, a report warned. 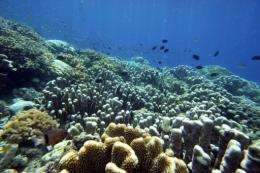 Warmer seas caused by global warming; ocean acidification blamed on carbon dioxide pollution; shipping, overfishing, coastal development and agricultural runoff all pose a threat to coral reefs, which hundreds of millions of people depend on for a living, says the report. "Threats on land, along the coast and in the water are converging in a perfect storm of threats to reefs," Jane Lubchenco, administrator of the National Oceanic and Atmospheric Administration (NOAA), said at a news conference in Washington to launch the "Reefs at Risk Revisited" report. According to the report, which follows on from an earlier study on the health of the world's coral reefs, more than 90 percent of reefs will be threatened by 2030 and nearly all reefs will be at risk by 2050 unless action is taken now to reduce the threats. 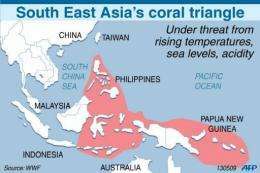 Map showing the extent of the South East Asian coral triangle, under threat from climate change. "Local pressures" on reefs, including overfishing, coastal development and pollution, pose the most immediate and direct threats to the world's reefs, threatening more than 60 percent of the colorful sea ecosystems. The impacts of climate change -- a "global threat" to reefs -- is compounding the local pressures. "Warming seas have already caused widespread damage to reefs, with high temperatures driving a stress response called coral bleaching, where corals lose their colorful symbiotic algae, exposing their white skeletons," the report says. "In addition, increasing carbon dioxide (CO2) emissions are slowly causing the world's oceans to become more acidic. Ocean acidification reduces coral growth rates and, if unchecked, could reduce their ability to maintain their physical structure." Quick, broad action could go a long way to saving the reefs, which have shown themselves in the past to be highly resilient, said Lauretta Burke, a lead author of the report, which was compiled by more than two dozen conservation and research groups led by World Resources International (WRI). A future with dying or dead reefs is "not a future we are committed to," Burke said. She urged global policymakers to take rapid action to improve marine management, reduce local threats, especially overfishing, and -- crucially -- cut greenhouse gas emissions. 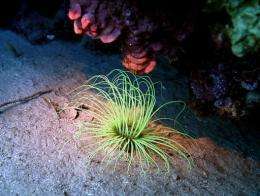 If no effort is made to stop the threats to the reefs, and they are lost, the daily livelihoods of 500 million people worldwide would be threatened, many of them in developing nations in southeast Asia and the Indian Ocean, said Lubchenco. There would be fewer nurseries for commercial fish species, and shorelines would lose some protection from storms. Coastal communities would lose an important source of protein and food security, not to mention revenues from tourists who travel to countries to visit their reefs and the "beautiful white sand beaches found throughout the tropics," which wouldn't be there without coral reefs, said Burke. "World's coral reefs could be gone by 2050"
But of course they won't be. I sure wish I could land funding for a study like this, but alas - I'm not an alarmist! Hang on a moment... Given their age, don't the world's great coral reefs predate the last major (naturally occuring, by the way) global warming? You know, the one that actually did happen, unlike today's supposed warming? Did the Great Barrier Reef exist next to Australia when the Vikings were growing grapes in North America? Hello? (tap tap tap) Is this thing on? And if you are wrong, then what? They won't be gone...just moved elsewhere...more appropriate! as they've always done! Eric, If I'm wrong, it wouldn't be the first time. But I'm not wrong. What a relief, right? If coral reefs are even mostly gone by 2050, I can't imagine humans being around a whole lot longer. This is a pretty scary thought. It is scary, and I don't think there is much that can be done to save the reefs by 2050. If you look at any of the discussions on environment, there is a strong propaganda arm from the right-wing that will deny any global warming effects are apparent. (they are real paid by the word RW propagandists). They are effective at recruiting less educated folks. With the coral reefs dead from CO2 acidification of the oceans, and global temp rise, I think by 2050, you will begin to see the "Soylant Green" effect. Look it up on Wikipedia. In the times of Coral (last 500My), the planet has been colder. The planet has been warmer. The planet has been struck by biosphere killing bolides and wracked by continent sized volcanic eruptions. So where did they move to? Any evidence? Acidic oceans, oil and human waste will destroy most major reefs by 2050. Already we've toxified the gulf. Enjoy your shrimp dinner by-the-way. Slowly but accelerating the damage that people are making on this planet it is putting us on a path towards extinction, science or not. Oh and also, if I sound alarmist its because I am alarmed. Thats the bottom line. The tropical coral reefs are not very productive for humans although they are pretty. 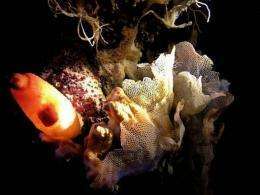 The northern reefs are doing fine according to a study by Norway on their deep water reefs. If ignorance is bliss you must be the happiest person on Earth! Where do you think the vast majority of the tropical and subtropical fish fry develop, species that are either directly or indirectly a major global food source?